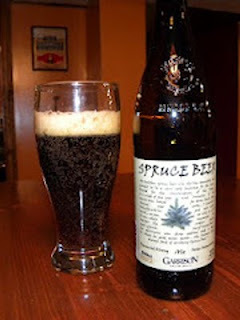 "North America’s oldest beer style brewed with local Spruce & Fir tips, blackstrap molasses and dates. Dark amber and brown colouring. Aroma is a comforting mix of spruce boughs, caramel malts, molasses and dates. Complex and full-bodied, it balances the crisp bitterness of spruce and fir gum with the warming flavours of molasses and bittersweet chocolate." This ale pours a deep copper colour almost "root beer". Has a fluffy off-white one finger head. Head retention is not long leaving a thin ring around the glass. The aroma is sweet with caramel and dark malts. There are hints of banana,vanilla and yes spruce! The taste is very sweet and medicinal. Lots of caramel and a pretty sharp pine/spruce taste that soon takes over the palate. The hop profile is hard to pick-up due to the pine/spruce attack. It has a medium mouth feel and full flavoured. My overall impression is OK. The label says it all, it is definitely a "Spruce beer". Unfortunately it over powers some of the malt, banana flavours trying to get out. It would like to try this on cask if given the chance. I would rate this a 7 out of 10.